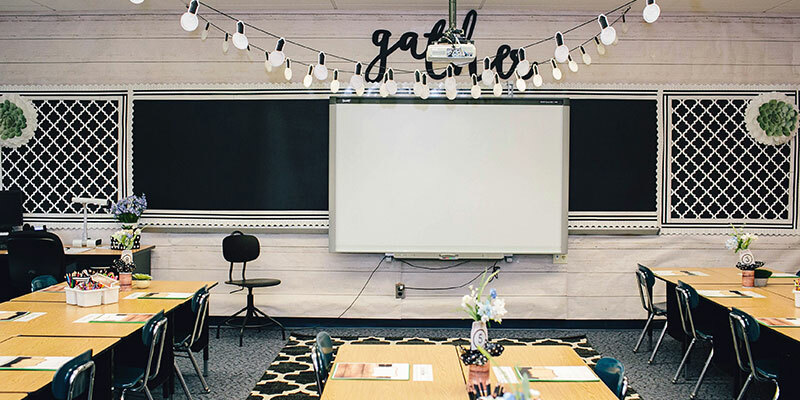 Pacon's Classroom Decor Gallery is filled with inspiring ideas you can use in your own classroom. 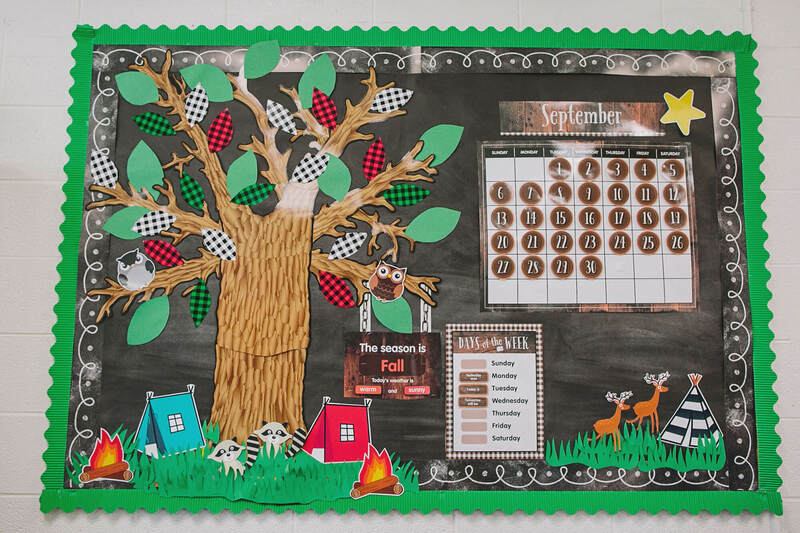 Keep scrolling to find inspiring bulletin board ideas, wow-worthy classroom decor, and ways to use Fadeless® Paper on and off the bulletin board. 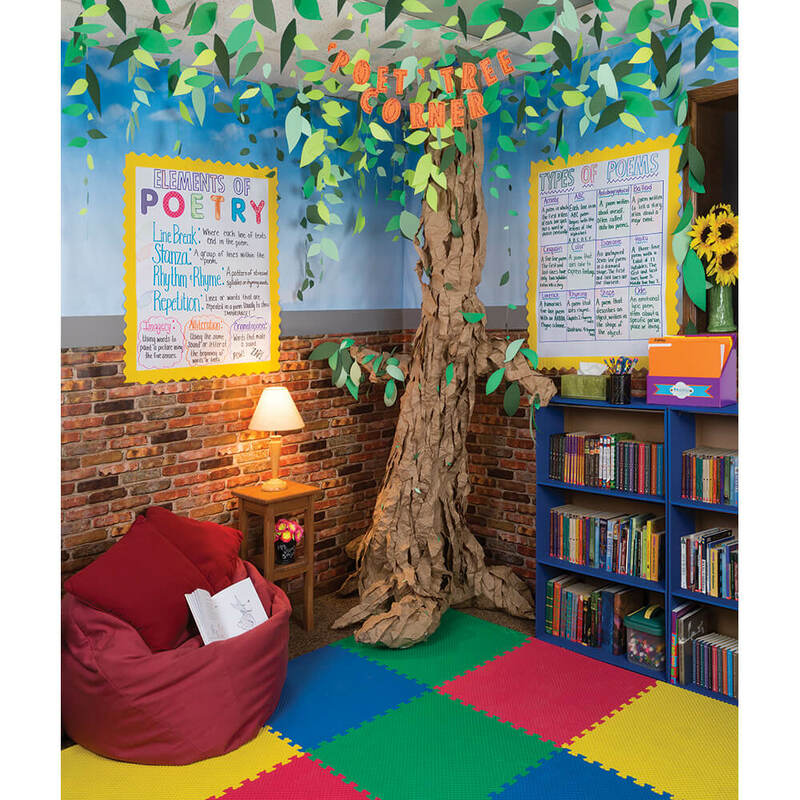 This poet-tree corner uses Fadeless® Reclaimed Brick and Wispy Clouds to set the scene. Our Anchor Chart paper was used to create poetry references for students. The Classroom Keepers® Bookcase is a great place to store all types of books next to some comfy flexible seating. Find out more about the products and process used to create this magical space on our projects page. 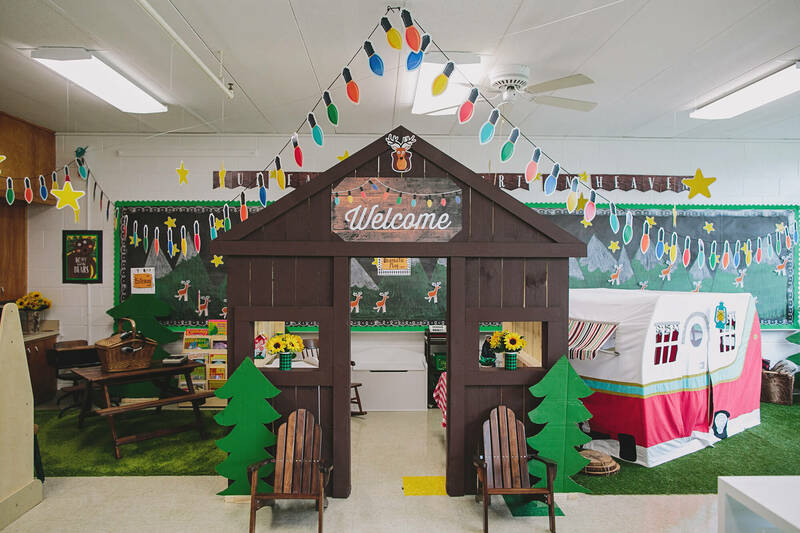 White Bordette® frames this cute farm theme classroom corner. Fadeless® Apple Green and Lite Blue are used as grass and sky. Natural Kraft Paper was creatively painted to look like a silo. Picket Fence Bordette® is corralling the paper plate cows. Our convenient 4" Self-Adhesive Letters spell out a fun message, and flowers crafted from Creativity Street® Chenille Stems are used for a three-dimensional accent. 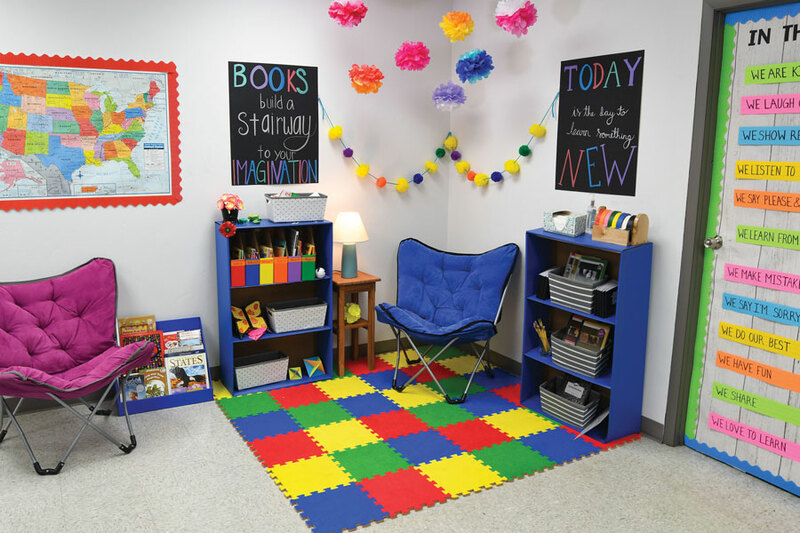 This cozy reading corner features our Classroom Keepers® Upright Bookcase, Classroom Keepers® Book Shelf, WonderFoam® Carpet Tiles, Chalkboard Poster Board, and White Shiplap Fadeless® on the doors. 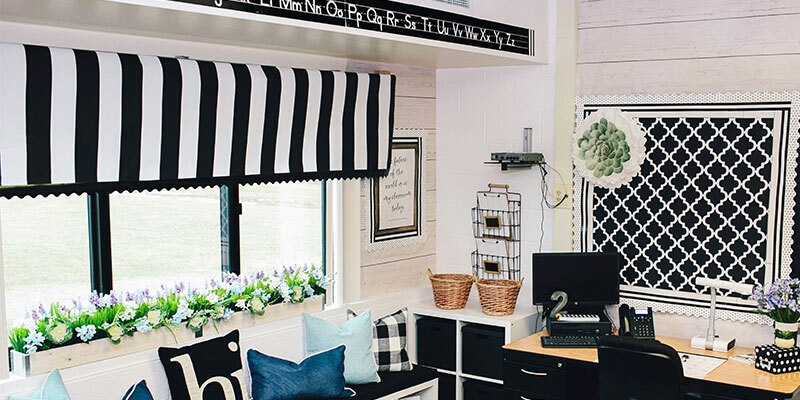 This Schoolgirl Style classroom uses Fadeless® Black & White Stripes and Moroccan as accents around the room, and features Fadeless® White Shiplap on the walls. 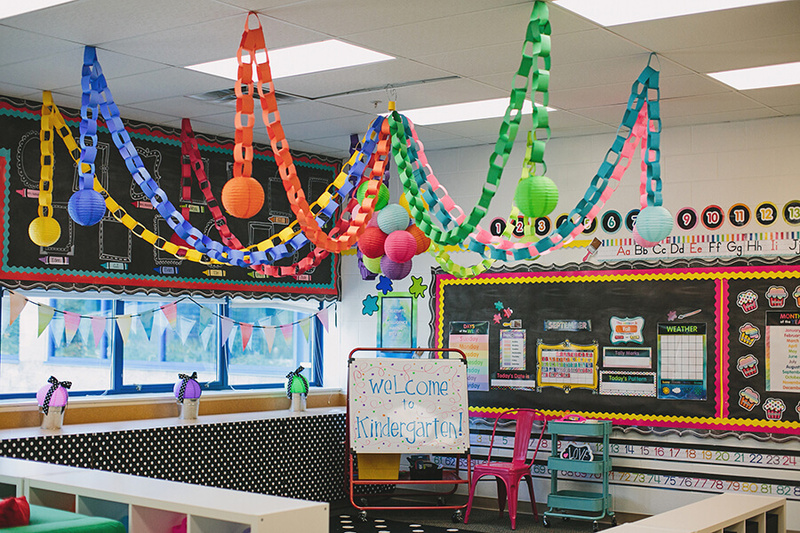 These beautiful classrooms were created by Schoolgirl Style, and feature Fadeless® Chalkboard Paper, Bordette® borders, and bright Tru-Ray® Construction Paper used as decorative paper chains. This camping theme features Fadeless® Chalkboard Paper with accents of Apple Green Bordette. 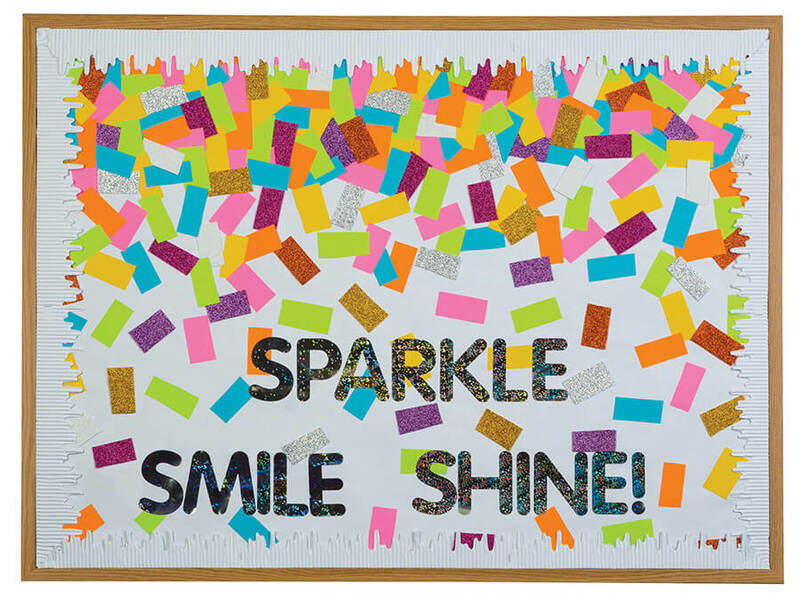 Fadeless® Galaxy is the perfect background for Schoolgirl Style's Celebrate Learning board decor from Carson-Dellosa. Our Bordette® Borders pair well with the set's colorful border. It's a jungle in Mrs. Ryan's class! 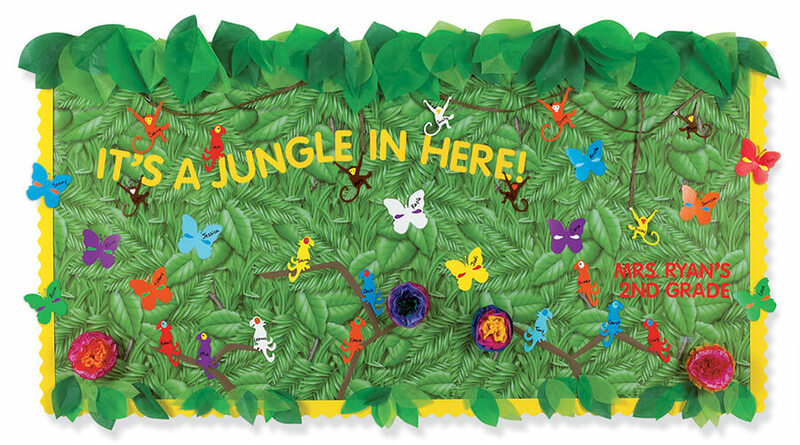 Green leaves and ferns set the scene for this classroom bulletin board. The Self-Adhesive Letters and Canary Bordette® accent this board perfectly. Fadeless® Shiplap paper is creatively used as a wooden ship sailing the sea on this pirate theme bulletin board. 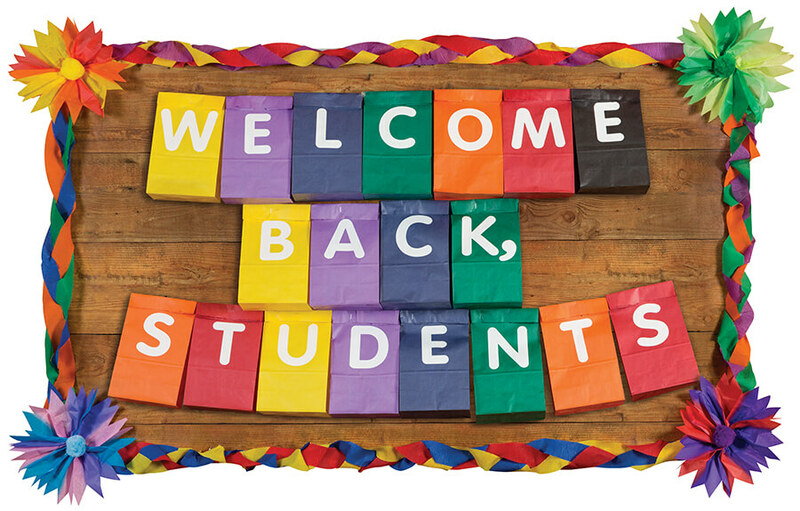 Red 4" Self-Adhesive Letters welcome students to the room with a fun greeting. Who says Icicles Bordette® can only be used on Winter-themed boards? Here Fadeless® Shiplap paper is used as a backdrop to a colorful welcome message using Rainbow® Kraft Bags and White 4" Self-Adhesive Letters. Creativity Street® Crepe Paper is braided into a unique border. 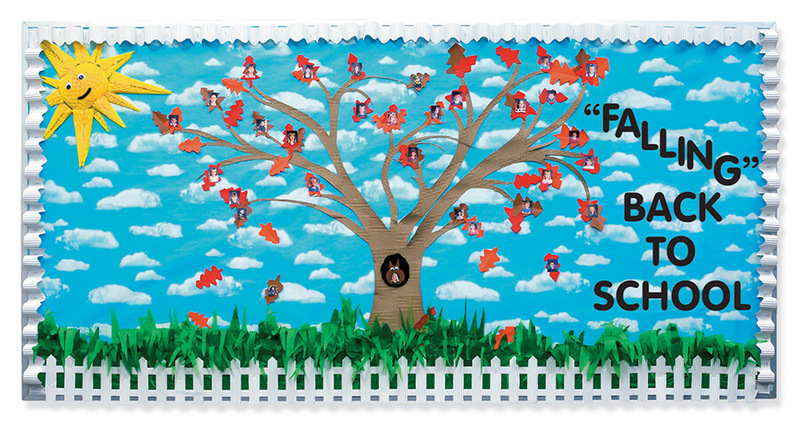 Fadeless® Clouds is used in this 3D Fall back-to-school bulletin board. The bottom is edged with Picket Fence Bordette® and features White Bordette® in a fluted edge along the other three sides. School Doodles Fadeess® features a black chalkboard look with a wide range of cute chalk drawings from sports and instruments, to books and backpacks. 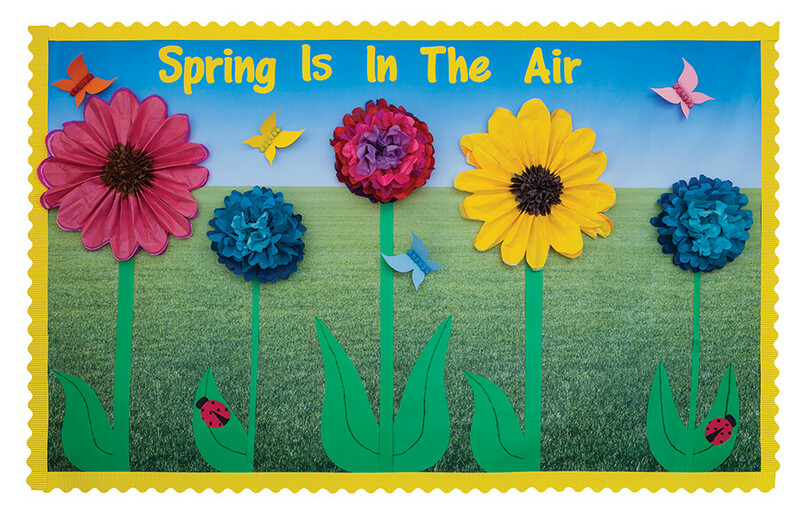 Bright sheets of Tru-Ray®Construction Paper highlight students work. 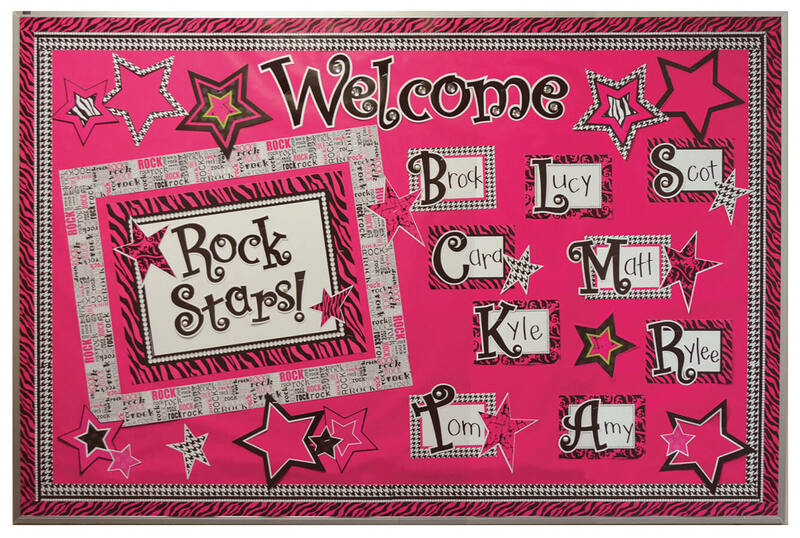 Welcome the kids back to school with a bright rock star bulletin board with Fadeless® Premium Glossy Rocker Magenta. 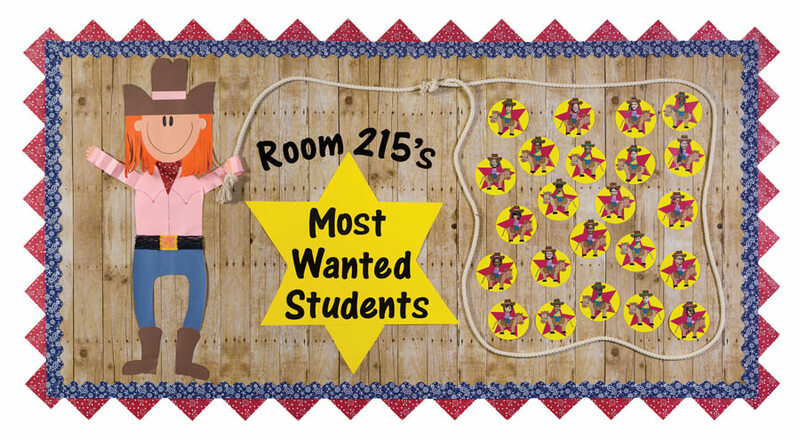 If you have a western or cowboy theme classroom, this board is for you! Weathered Wood Fadeless® and Bandana Bordette® were used for this design. 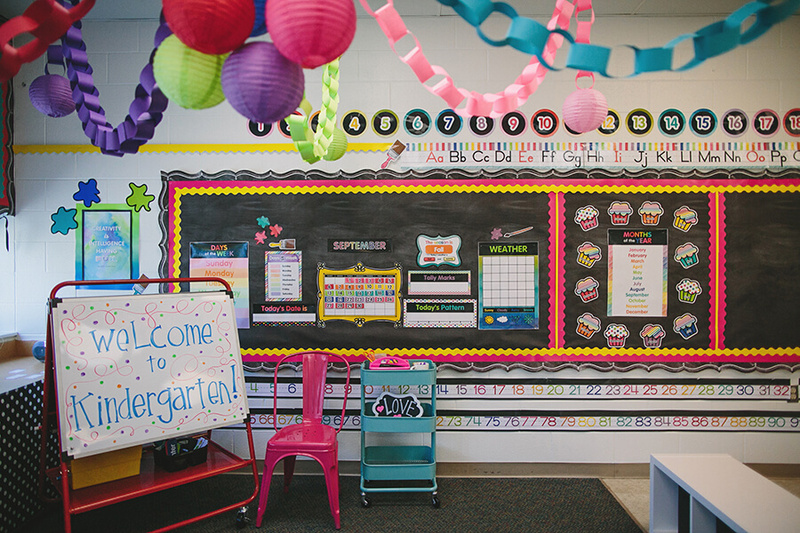 Black Fadeless® really makes this brightly colored Carson-Dellosa and Schoolgirl Style decor pop. Bordette® Nile Green and Violet peek out from the inspiring border. 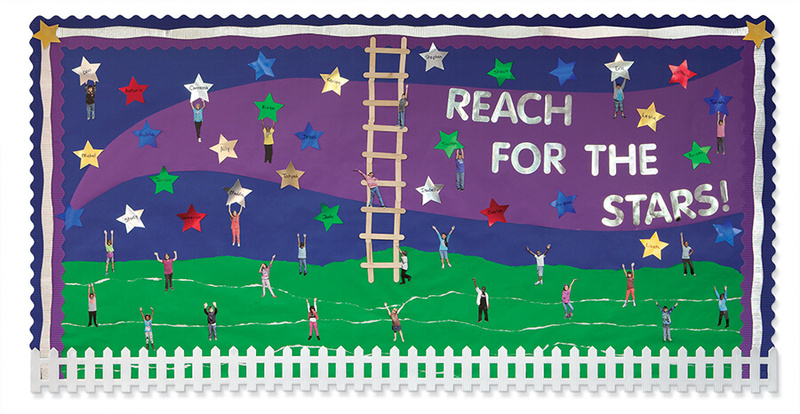 Encourage students to reach for the stars with a bulletin board featuring them! This scene was created with solid colored Fadeless® Paper. The grass was created by tearing and layering the paper to give it a unique effect. The board is edged with three colors of Bordette®, including Metallic Silver. Picket Fence Bordette® is used along the bottom to tie it all together. This boards features A LOT of glitter, but there was NO MESS in the making because of our convenient products. WonderFoam® Glitter Sheets and Dazzle Letters shine on the White Fadeless® Paper. Fadeless® Bubbles is the perfect backdrop for this Under the Sea theme. 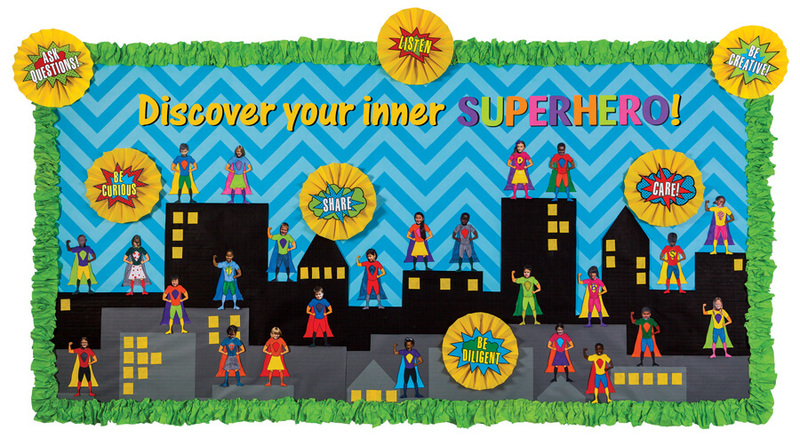 Inspire your students to be superheroes with this display. 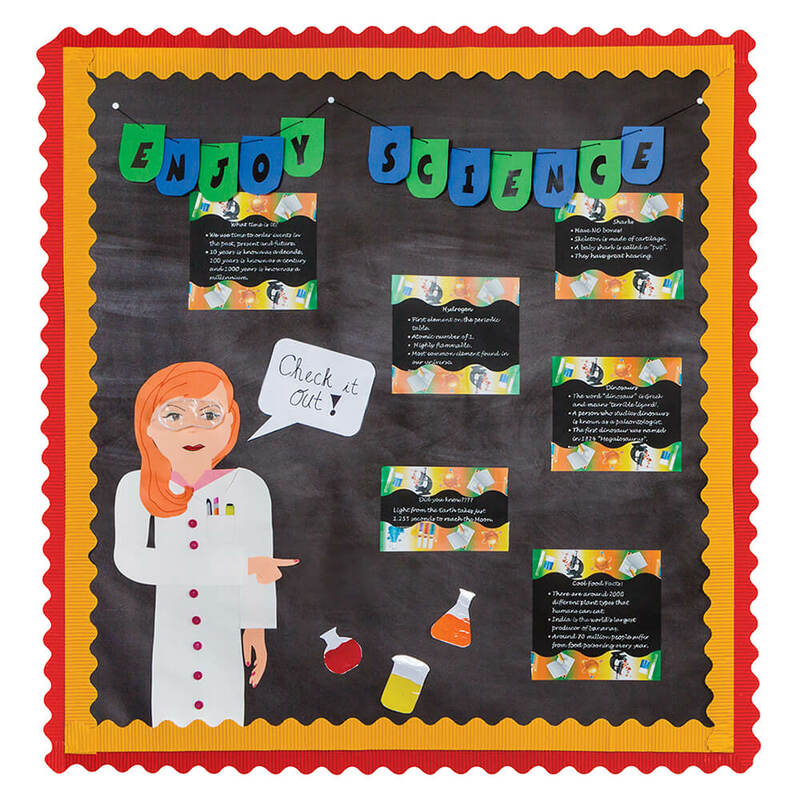 Visit our projects page to download the templates and learn how to recreate this board in your classroom. 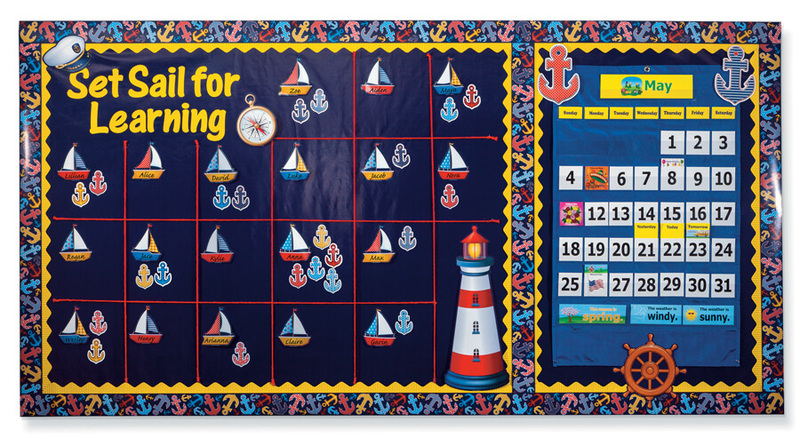 Display students names on this "set sail for learning" bulletin board. The Nautical Navy Premium Glossy Fadeless® is the perfect color for this nautical theme. The calendar and weather pocket chart is displayed on the right. 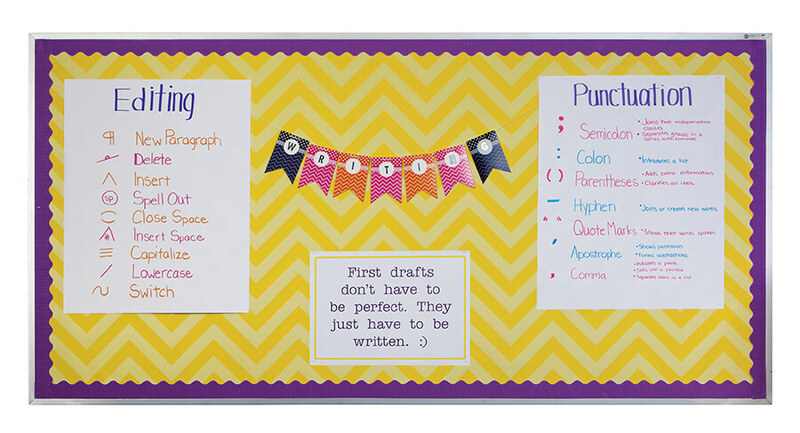 Yellow Chevron Fadeless® provides a cheery backdrop for these editing and punctuation anchor charts. Encourage students to pick up a good book! Recreate this look with Fadeless®Natural Burlap and Brown Bordette®. The fire flames feature Tru-Ray®Construction Paper and our colored cellophane. 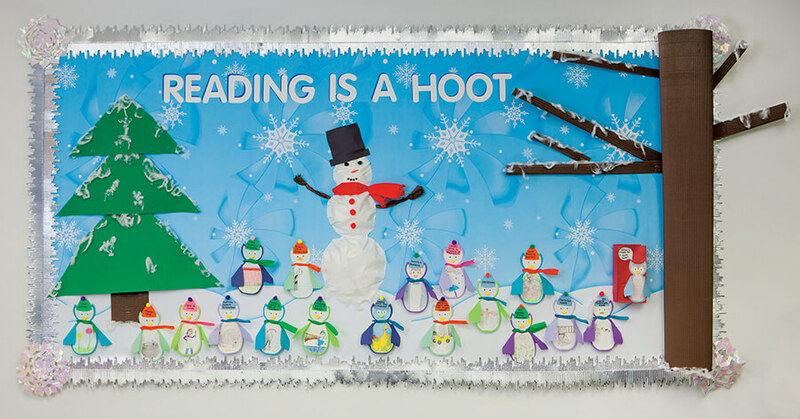 This interactive bulletin board features students' book recommendations on Fadeless® Winter Time. The board is framed with Metallic Silver Icicles Bordette®, and uses Corobuff® for a fun 3D effect. Showcase fun science facts on Fadeless® Chalkboard. 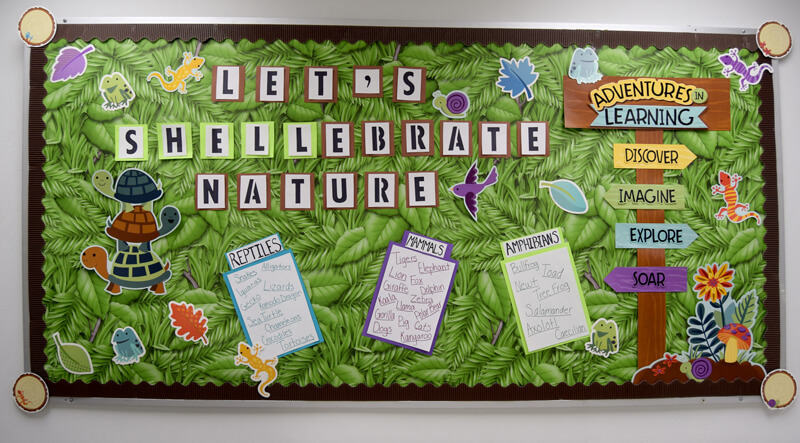 Celebrate nature with this interactive bulletin board. Have students identify reptiles, mammals, and amphibians. Tropical Foliage Fadeless® pairs perfectly with Carson-Dellosa's Nature Explorers accents. 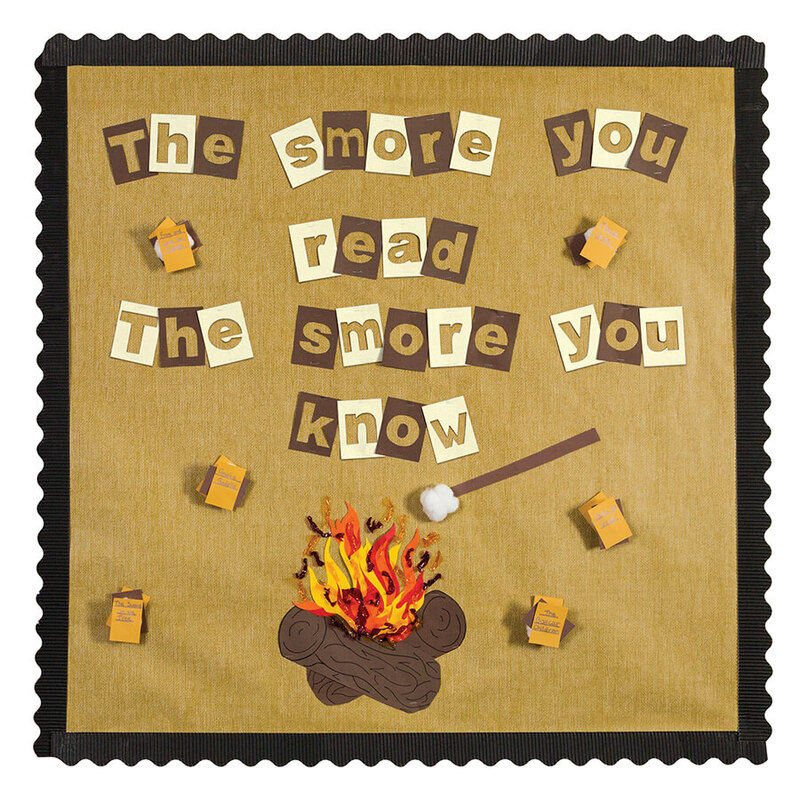 Find the averages with help of this camping theme bulletin board featuring our popular Night Sky Fadeless® design. 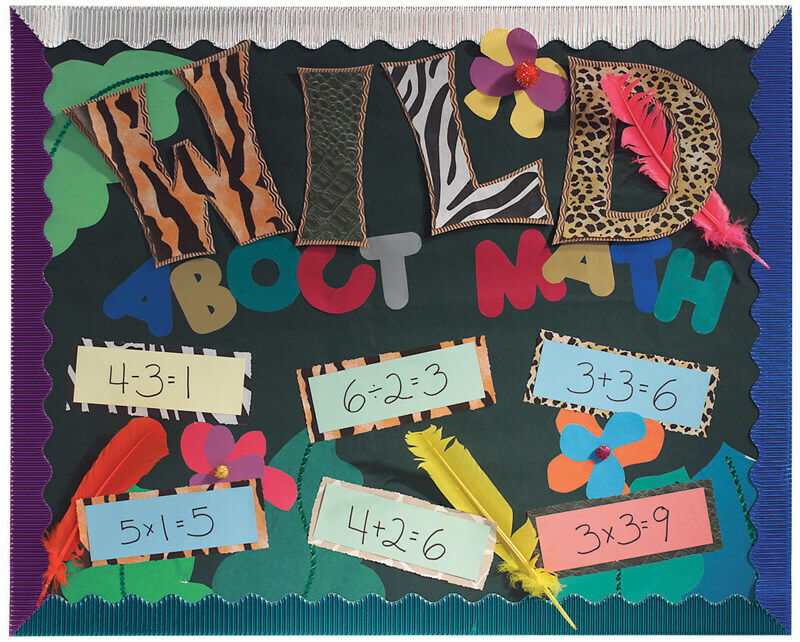 Take a walk on the wild side with this math bulletin board. Safari Print Fadeless® Sheets and Metallic Bordette® add interest to this design. 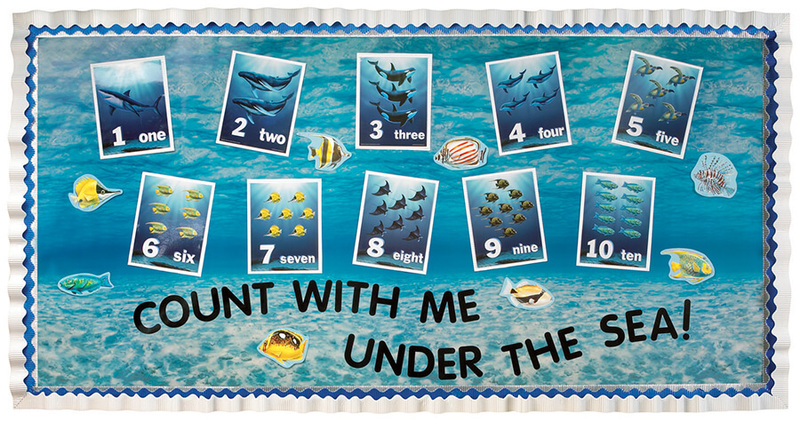 This bulletin board is perfect for Kindergarten classrooms and for those working on number recognition. 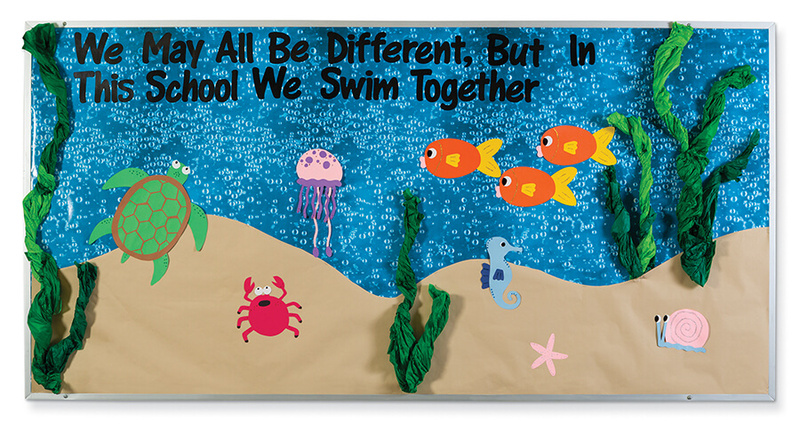 Fadeless® Under the Sea makes a splash on this aquatic board. 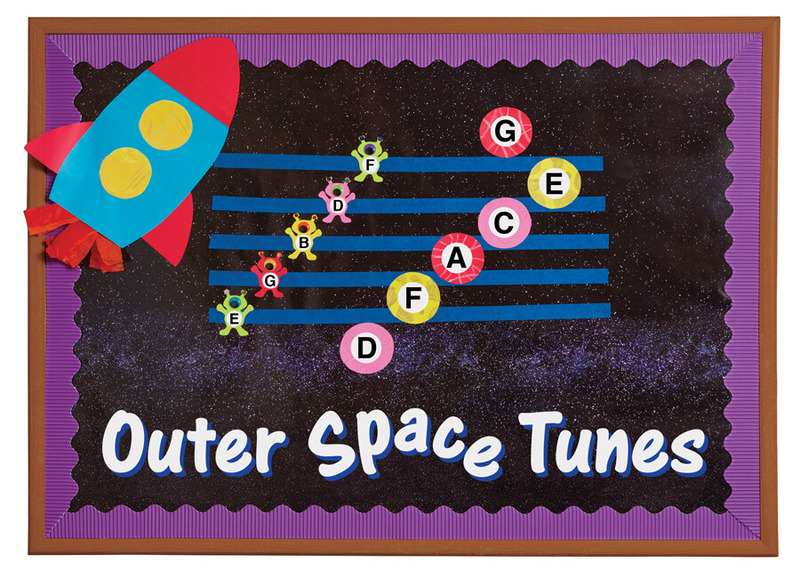 Help students remember notes with an out of this world bulletin board. Use Fadeless® Galaxy to set the space scene. 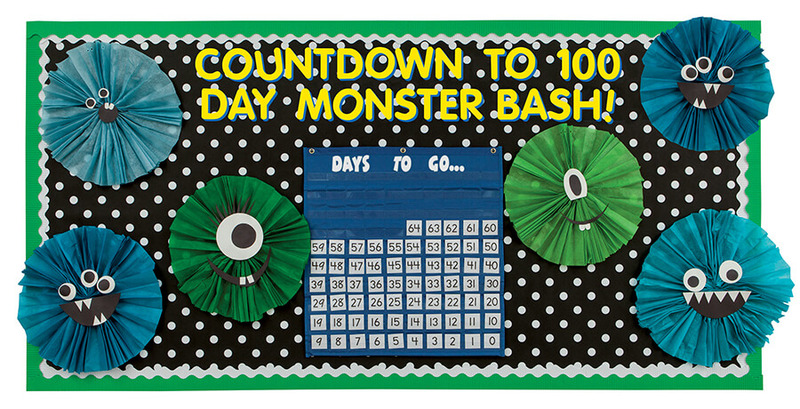 Use our Hundreds Pocket Chart to countdown to the 100th day of school. The monsters were created with KolorFast® Tissue and Tru-Ray® Construction Paper. The board features Black and White Dots Fadeless® and 4" Self-Adhesive Letters. 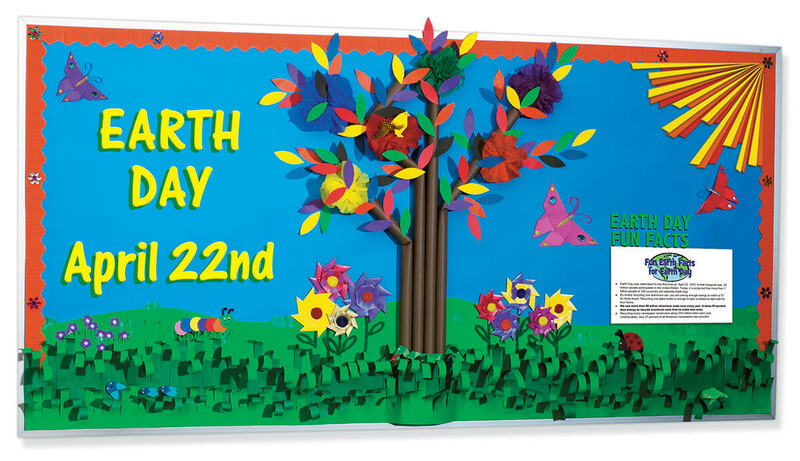 This 3D bulletin board features solid color Fadeless® Paper and important earth day facts to discuss as a class. 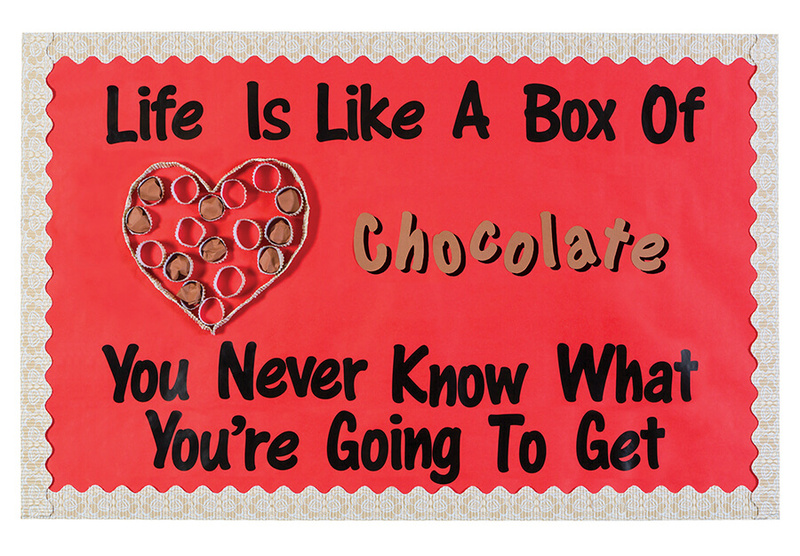 This Valentine's Day display a large box of chocolates and use our 4" Self-Adhesive Letters to write out: Life is like a box of chocolates, you never know what you're going to get. Vintage Lace Bordette® adds a delicate touch. Spring is here! Use Fadeless® Summer Horizon as a backdrop for beautiful 3D flowers. Galvanized Metal Fadeless® provides the perfect background for this robot door. Cut out gears and assemble the robot from our Premium Coated Poster Board, and frame the door with Metallic Silver Icicles Bordette®. Premium Glossy Fadeless® adds a colorful shine to any display. 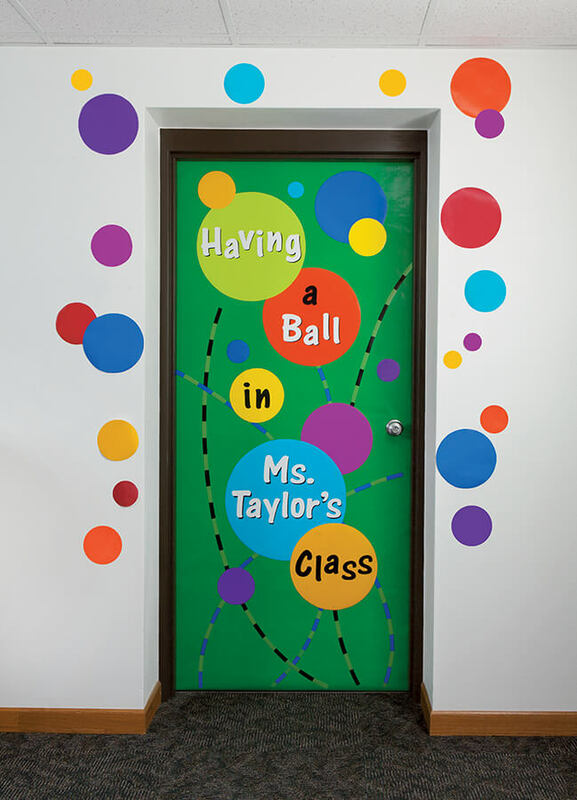 The 4" Self-Adhesive Lettersmake it easy to showcase a fun greeting like "having a ball in Ms. Taylor's class". 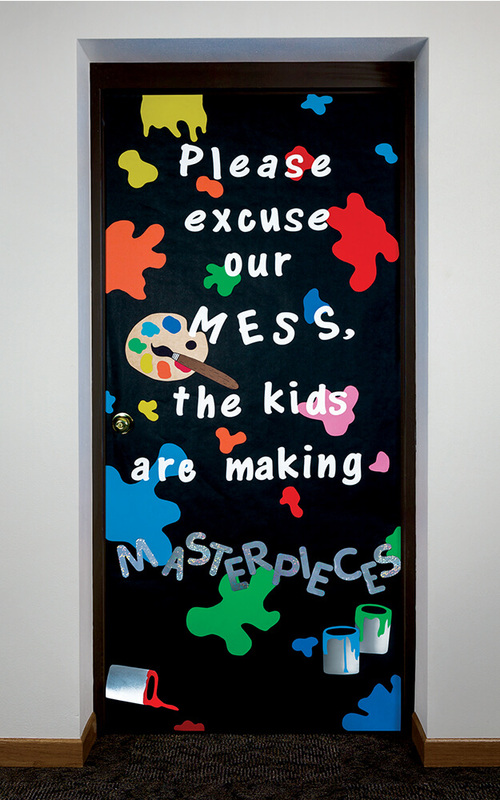 Black Fadeless® was used to showcase a rainbow of spilled paints and a warning: Please excuse our mess, the kids are making masterpieces. Perfect for an art room door! Use our Self-Adhesive Letters to make it even easier. 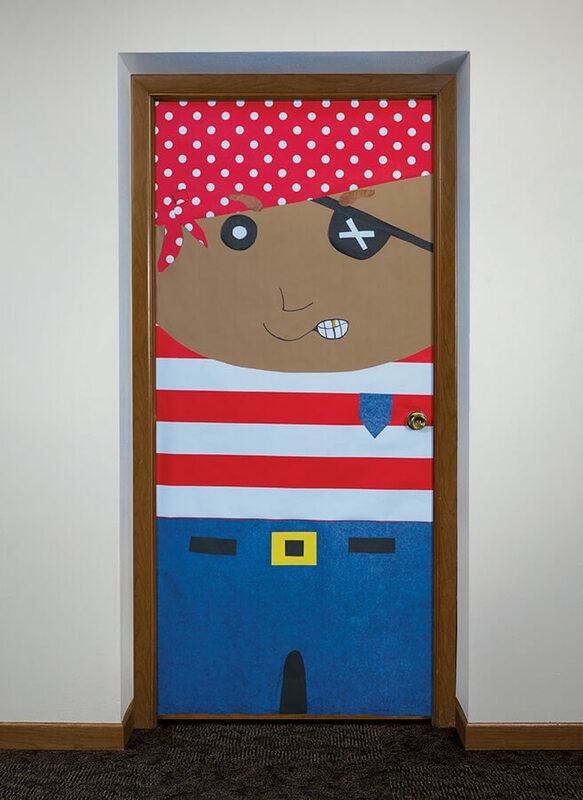 Recreate this pirate door with Fadeless® Red and White Stripes, Classic Dots, and Denim. 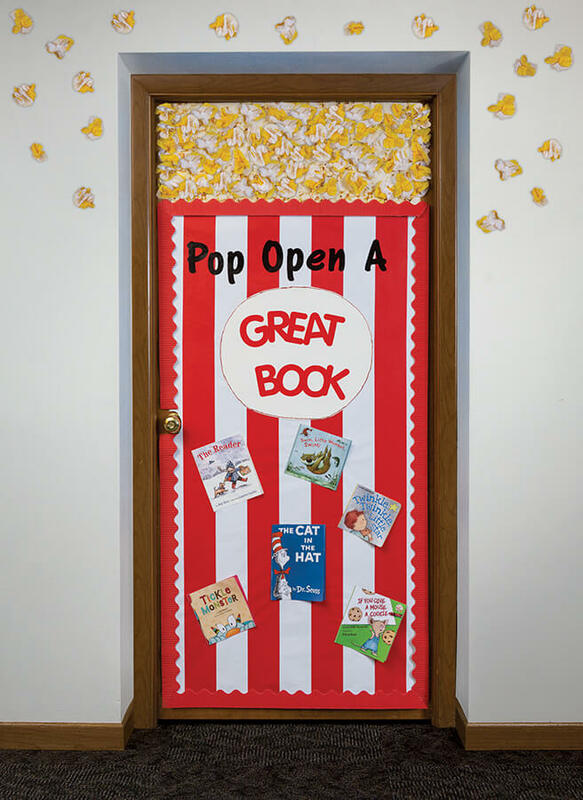 Encourage students and passersby to pop open a great book with this popcorn theme door featuring Fadeless® Red and White Stripes. 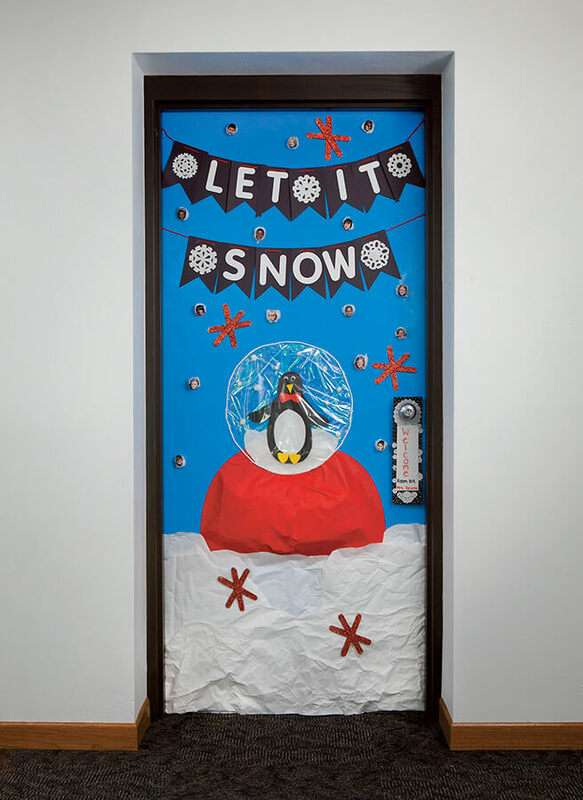 Celebrate winter all season long with this 3D door crafted from Fadeless® paper. A cute penguin sits inside a snow globe, while white cotton fluffs (featuring students' faces) float down from the sky.